Chopsticks have been used as key eating utensils in China for centuries. In fact, chopsticks were first invented in ancient China before their use spread to other East Asian countries, including Japan and Korea. Their use later spread further to places like Vietnam, Thailand, Malaysia, Indonesia, Taiwan and the Philippines through Chinese immigrants who settled there and China’s growing cultural influence in the region. The earliest evidence of chopsticks suggests that they were likely used as cooking and perhaps serving instruments rather than primary eating utensils, but over time, chopsticks — along with the spoon — became must-haves at the Chinese dinner table. Chopsticks are shaped, equal-length pairs of sticks that have been smoothed and commonly tapered with the thinnest ends used for picking up pieces of food. Though most Americans are familiar with the wooden or even plastic chopsticks offered at their favorite Asian restaurants, chopsticks have historically been made from a variety of materials including bamboo and stainless steel. They have also been fashioned from ivory, jade, porcelain and even gold. The style of chopsticks varies from country to country, with different preferences for lengths and shapes. In China, people tend to prefer longer and thicker styles up to 25 centimeters (9.8 inches) long. 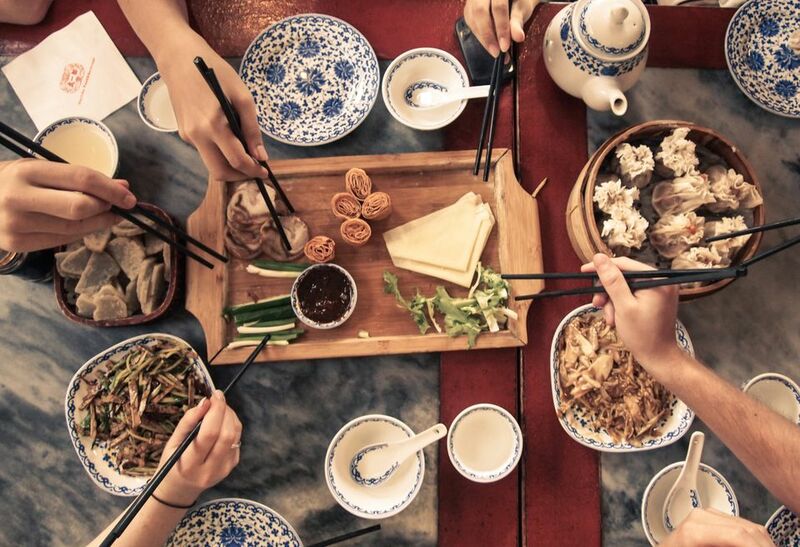 As in many cultures, proper dinner table etiquette is of the utmost importance to the Chinese. While there are many basic chopstick etiquette rules and common procedures for politeness, learning to use chopsticks properly is one of the most important. Below are some tips and simple steps explaining how to use chopsticks. If possible, use wood or bamboo chopsticks. Plastic chopsticks are more slippery and harder to hold. Always grab the chopsticks in the middle, making sure that the ends are even and do not cross. Pick up a chopstick and hold it so that it's resting comfortably ​between the tip of your fourth finger (the ring finger) and the hollow gap between your thumb and index finger. Keep the fourth finger straight. This will be the bottom chopstick. Now pick up the other chopstick and place it on top, firmly between the tips of your thumb, index and middle fingers. The index and middle fingers should be curled. Note: Children often find it easier to hold chopsticks nearer the bottom instead of in the middle. When eating, always keep the bottom chopstick stationary and use the top chopstick to maneuver and pick up food. To pick up food, straighten your index and middle fingers as much as needed to move the top chopstick outward. Grab the food, then bring the chopsticks together by curling your index and middle fingers. The basic idea is to use the chopstick as a pivot, with the thumb being the axle. Lift the food up to your mouth, leaning over if necessary. For foods containing bones (such as chicken), hold the food with the chopsticks and eat around the bone.